I’m interested in how we survive by the labor of our own hands, and who we choose to love. Those are my two themes—they’re in every book I write. Adriana Trigiani’s latest novel is an unabashedly romantic story of Hollywood’s golden age, peopled with the stars of yesteryear — Spencer Tracy, David Niven, Myrna Loy, Carole Lombard, Hattie McDaniel — and Clark Gable and Loretta Young. Trigiani paints a romantic picture of Gable and Young as star-crossed lovers, kept apart by the strict moral codes and sexist double standard of the times. Their problems were not of the heart, or their intentions, but of the practical world, which was defined by the wily and improbable laws enforced by the studios that employed them, and by the public, whose ticket dollars gave them the final say. Gable and Young were indentured to the stardom that made their lifestyle possible. Fans of old movies and old-fashioned, multi-generational sagas will love All the Stars in the Heavens. It’s the kind of novels described in blurbs as “sweeping” — an overused word that is, nonetheless, apt when applied to this Hollywood epic. If the book were a movie it would be called a “biopic”. We first meet Loretta Young as a child actress, working to help her single mother pay the bills, and follow her as she becomes a leading lady in Hollywood, falling in love with the wrong men, and eventually a grandmother, watching herself and Clark Gable on a VHS tape of The Call of the Wild. Warning to readers: don’t Google “Loretta Young”, “Clark Gable” — or anything else in the book that piques your curiosity. I made the mistake of doing that and I not only ruined the story for myself, but came across some recent information (so recent that Trigiani wouldn’t have known about it while writing the book) that cast doubt on one of the central plot elements. Granted, All the Stars in the Heavens is fiction, but it’s clear Trigiani tried to keep her story within the basic outline of Young’s life. The dialogue in All the Stars in the Heavens does sound like a movie script — a movie script from another era. It’s sometimes corny, but often the repartee is witty and flirtatious. Trigiani knows how to set a scene too, from the cold and isolated area of northern Washington where The Call of the Wild was filmed to the ancient and crowded neighborhood in Padua, Italy where Alda’s family lives. Would I recommend All the Stars in the Heaven? For me, it was a welcome break from serious nonfiction, as well as a nostalgic trip to a bygone era. It’s fun reading, and you’ll learn a little something about old Hollywood. Like many of the movies the book references, All the Stars in the Heavens is clever, entertaining, and doesn’t probe too deeply. Trigiani is a terrific storyteller, and she has great material to work with in this book — which is her first biographical novel. And every once in a while, what you need is a Hollywood novel that gives you a glimpse of a glamorous world that no longer exists. I also recommend A Touch of Stardust by Kate Alcott (the filming of Gone With the Wind) and, if you’d prefer something more literary, Beautiful Ruins by Jess Walter (the making of Cleopatra). Stories are people. I’m a story, you’re a story . . . your father is a story. Our stories go in every direction, but sometimes, if we’re lucky, our stories join into one, and for a while, we’re less alone. 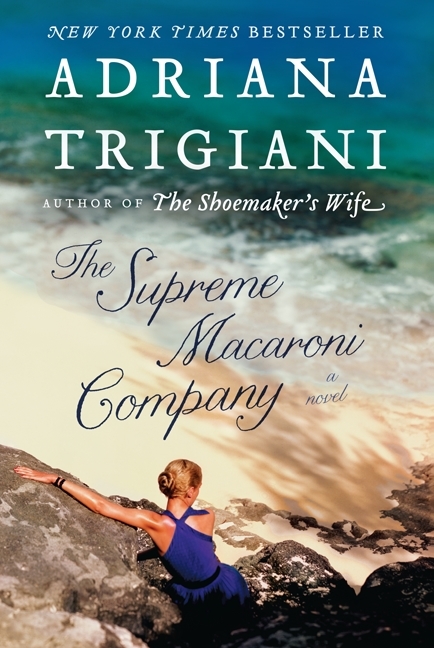 Click here for my review of Adriana Trigiani’s 2014 release, The Supreme Macaroni Company. Every once in a while, I’m in the mood for a fun escape novel. When that mood strikes, I want to read something clever, entertaining, and well-written, with a touch of humor. Sometimes I need the reading version of comfort food — macaroni and cheese, anyone? Adriana Trigiani’s novels are perfect “comfort reading” — they’re warm and substantial. The Supreme Macaroni Company — which has almost nothing to do with a macaroni company — is the third in a series about shoe designer Valentine Roncalli and her family. (Trigiani has also written stand-alone novels and a memoir.) I’ve read almost all of Trigiani’s books, and every one is a delight. Don’t worry about reading them in order; you’ll enjoy your introduction to Trigiani’s wonderful characters wherever you start, and Trigiani skillfully weaves the background information into each story. A shoemaker would marry a tanner. Shoemakers and tanners form a symbiotic relationship out of necessity. One provides the leather while the other whips it into a glorious creation. At Vechiarelli & Son in Arezzo, Gianluca creates some of the most sumptuous leather, calfskin, and suede in Italy . . . For over a century, there has been and remains a shorthand between our families’ shops. The Angelini Shoe Company in Greenwich Village has proudly used Vechiarelli & Son’s goods for generations. Years from now, you’ll want a permanent record of your wedding. An invitation is the bride’s Dead Sea scroll at the bottom of her hope chest . . . I’ll have the invitations printed up. You don’t even have to look at them. When Chrissy Pipino got married, she had a fold-out card with a tissue, and if you remember, it was gold-leafed. She even had a pop-up angel. You yanked a satin ribbon and the little cherub went over and down like a windshield wiper. We don’t have time for a pop-up, but we will have our version of Caravaggio angels. “What happened to Father Drake?” Tess asked. “He’s giving last rites at Queens County Hospital,” Mom explained. “He’s from Nigeria,” Mom snapped. It’s easy to see that Trigiani has a background in TV sitcom writing! But she also writes lovely prose, equally at home describing the beauty of the Hudson River at night, the otherworldly appeal of New Orleans, and the struggle within Valentine between love and work.